The Elizabeth Towers Hotel was one of the first buildings I came to recognise when I moved to Melbourne at the beginning of 2001. I was living in North Melbourne and I used to walk past it on my way to classes at the University of Melbourne. It stood out for it’s spiral staircase, enclosed in glass right on the corner of the intersection, which was brightly lit up at night. I always thought it was a great staircase. Before it’s metamorphosis into the Elizabeth Towers Hotel, it was Ampol House, the headquarters for the Ampol petrol company. 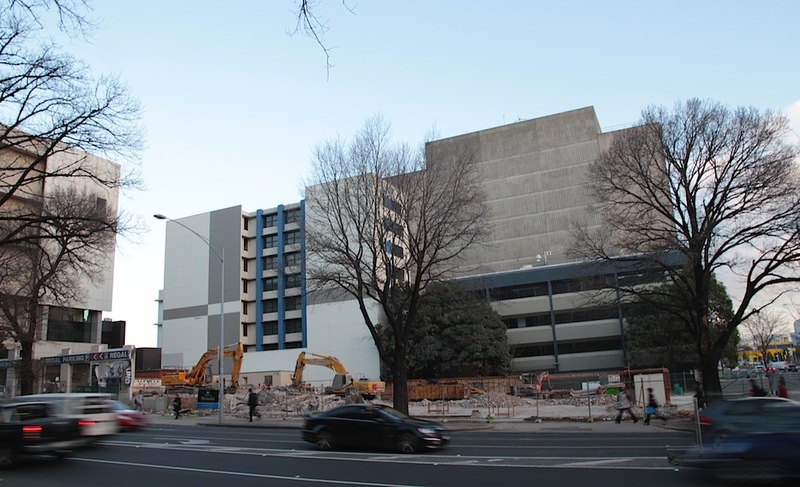 “The National Trust says the 1958 building is the last of its kind” (Julie Szego, The Age). The building was apparently protected by heritage overlay, but this wasn’t enough to stop the University, who owned the building, being able to demolish it. They will then be constructing their planned $186 million Peter Doherty Institute for Infectious Disease and Immunology on the site. When I heard it was to be demolished, I was pretty disappointed. I really liked that staircase, and… well, you know, actually that was all I really liked about it. The building itself was pretty boring. It was, however, a good example of a past era of architecture. I’d heard a rumour from another University of Melbourne employee that the Uni was planning to retain the staircase in the plans for it’s new buildings. Clearly that was not to be. This afternoon, I went past to find that the hungry yellow machines had made fast work of the hotel. Even though it wasn’t a beautiful building in comparison with, say, much of the Gothic or Victorian architecture dotted around the city, I am still disappointed we have lost yet more of our Olympic-era history (is there even any left?) 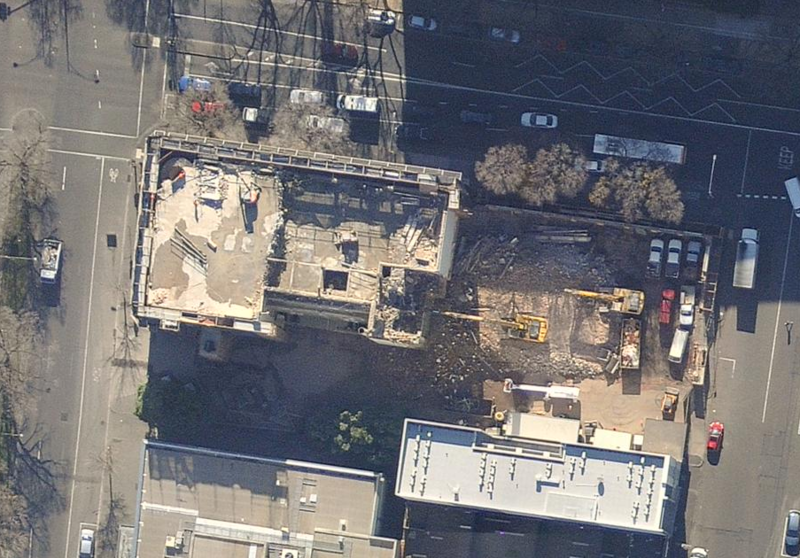 However, what really shits me is that a building that is heritage listed can just be demolished like that with full permission. Did the university need to build an entirely new building as opposed to renovating the old one in order to accommodate it’s world-class medical facilities? Maybe, maybe not. The only upside is that the new development will be something entirely useful, as opposed to another block of bland yuppie apartments which is generally the norm these days. ~ by Kitten of Doom on August 11, 2011.